All students who live within the home zone described below, and as shown on the attached map, shall be entitled to enrol at the school. Starting at the intersection of Williamson Avenue, Harcourt Street (excluded) and Schofield Street (excluded) travels east along Williamson Avenue to Ponsonby Road. Travel south east along the centre of Ponsonby Road (86 and below, even numbers only included), to the east along centre Karangahape Road (72-582, even numbers only included) to the Symonds Street. Travel south along Symonds Street (82-116, even numbers only included), west along Alex Evans Street and south along St Benedict Street. Travel east along Newton Road to Symonds Street. 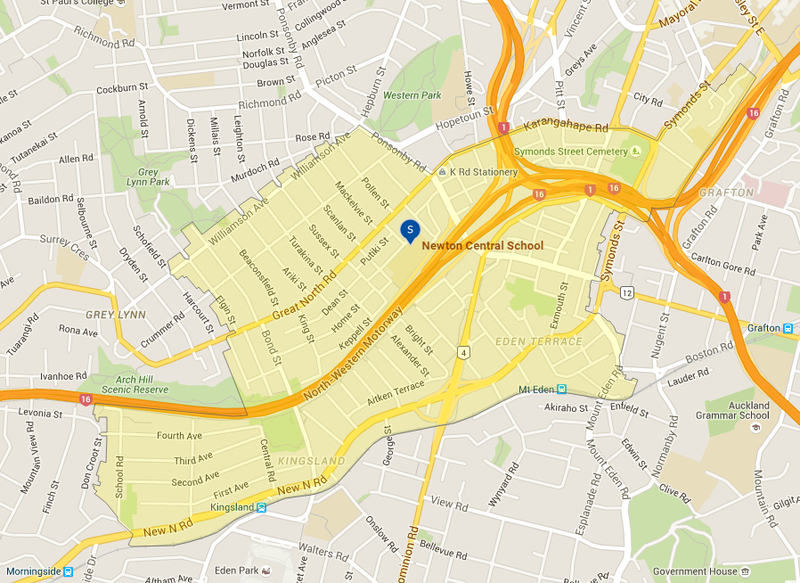 Travel south along Symonds Street (109-250 excluded) and south east along Mt Eden Road (26, 97 and below included) to the railway line. Follow the railway line west to Sandringham Road (excluded). Travel north and west along New North Road (587, 570 and below included) to Western Springs Road (excluded) and encompassing all of First, Second, Third and Fourth Avenues. Travel north on School Road to the motorway east to and north along Commercial Road. Travel east long Great North Road (335, 370 and below included), north along Elgin Street and west along Williamson Avenue back to the starting point. This must be in the form of a current rates bill, electricity bill or tenancy agreement. We ask that you complete the enrolment form at your earliest convenience, allowing us to ensure we have space and staff available to accommodate your child’s learning needs.